Meet Rowdy The Garbage Truck! He doesnt just pick up garbage, he recycles it! Create trashcans and bottles with Play-Doh compound. Then help Rowdy The Garbage Truck scoop it up and turn it into goofy garbage as he rolls along! Contains Rowdy The Garbage Truck playset with 2 book moulds, bin, shovel, trash can extruder, instructions and 4 cans of Play-Doh Brand Modelling Compound…. Make it, dump it, roll it and recycle it with Recycling Rowdy who is here to help clean up the mess! 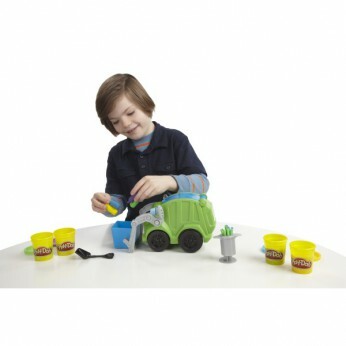 Help this Play-Doh truck scoop up the rubbish by filling the moveable lift which empties right into his truck and then push Rowdy along and the Play-Doh will pass through him and come out as bits of rubbish, providing endless fun and creativity. Size H24.1, W41.9, D9.2cm; For ages 3 years and over; EAN: 5010994727529. WARNING(S): Only for domestic use; To be used under the direct supervision of an adult. This toy costs approximately £18.99 (for the latest and best prices make sure you check our retailer list for the Play Doh Trash Tossin Rowdy Garbage Truck above). In our review of Play Doh Trash Tossin Rowdy Garbage Truck we classed it as being suitable for ages 1 to 3 years, 3 years, 4 years, 5 years but recommend you check the manufacturer specific advice before purchasing.